A deadly bus crash killed four people and injured 54 passengers May 31, 2011, on Interstate 95 in Virginia. On the one-year anniversary of the Sky Express bus crash, the Federal Motor Carrier Safety Administration announced that it has shut down 26 bus companies in its single largest safety crackdown. Three of the primary companies that were shut down were Apex Bus, Inc. and I-95 Coach, Inc., both from New York City, and New Century Travel Inc. of Philadelphia, Pennsylvania. The FMCSA investigation found that these three companies ?oversaw a broad network of other bus companies? that were shut down as well. ?Today, we?re announcing that we have shut down 26 curbside bus operators that broke our safety rules and put passengers and others in danger,? U.S. Transportation Secretary Ray LaHood told reporters on a conference call on Thursday about the agency?s safety sweep. He said the three primary companies ?blatantly and repeatedly violated safety rules.? The 26 bus operations that were shut down transport more than 1,800 passengers per day from New York to Florida along the I-95 corridor. ?They used drivers who did not hold commercial licenses, and they drove buses that did not meet our safety standards,? LaHood said. ?By ignoring safety rules, these operators put both passengers and other motorists at serious risk and shutting them down could save lives.? According to the FMCSA release, the agency is ?taking further steps to ensure the bus companies they shut down today cannot continue to operate under other names.? FMCSA?s reincarnated carriers? rule was published in April and expands the agency?s authority to ?take action against unsafe motor carriers that attempt to evade enforcement by ?reincarnating? into other forms or by illegally continuing their operations through affiliate companies. According to FMCSA investigators, they uncovered numerous safety violations. Besides drivers not having CDLs, the companies did not have alcohol and drug testing programs and did not regular vehicle inspections. FMCSA Administrator Anne S. Ferro said on the conference call that at this time no fines have been assessed to the 26 bus companies that were shut down. However, Ferro said that if the companies continue to operate after receiving the imminent hazard orders, they will be assessed a $2,200 fine per day. She said there is a provision in the Senate version of the highway bill that would allow the agency to increase its fines to $25,000 per day for companies that violate the orders and continue operating. LaHood said that all bus companies should be on notice to follow the FMCSA safety rules. ?Follow the rules and keep people safe or we will shut you down,? he said. Poster's Note; Fung Wah, a major New York curbside operator, was not implicated. Note; the bus depicted in the photo below by Emily Ann Epstein for www.metro.u.s. is used for illustrative purposes only and is not necessarily involved in the action. What I don't understand is how they've been allowed to operate this long. When I managed a small charter company I had to go to Harrisburg with proof of insurance everytime a coach needed it's registration renewed. If you didn't have proper insurance, you were shut down. I'm certain that New York has the same requirement. Our insurance carrier required regular updates on our drivers, including copies of their licenses and physical cards. They (and the PA PUC) insisted on the rules requiring random drug tests and reports on post-accident drug and alcohol testing. Maybe they were self-insured and simply ignored everything they should be doing, or the state and feds weren't doing their jobs. Anyhow, it's good to see them shut down. FED safety people to keep on top of all of it. Those of us in the business have been very much aware of it for decades. It has been apparent that, given a small operator with ten to a dozen vehicles, it quite rare to see much of any FED enforcement. Very true Vern. While the PA PUC would check us occasionally, the only time I even met an ICC inspector was at Hershey Park. I was parked behind a Greyhound on the lot, taking a nap. Heard a tap on the window and opened the door to find a guy with an ICC ID hanging around his neck. He asked what happend to the Greyhound that was in front of me. I told him I guess he left while I was sleeping. The agent said that he wasn't interested in me since I was local but he really wanted to inspect the Greyhound. Though I have not received Counsel from our esteemed "Mr L" about this, I think the Statute of Limitations has passed on near all of these past recollections. In the Bad, Old Days of ICC Regulation, it was all an elaborate fun and games exercise. 'Enforcement' would beat on GREYHOUND, and selected TRAILWAYS lines, as all knew (like Dillinger), "...that's where the money is!...". So, beating The Dog went on all the time. Fast Forward to today's instant insanity. Yes, yes, some flagrant operators shut down, for the moment. Didja' notice it was against but three major players, who ran under twenty-six (26) different entities. As a practical matter, 'Enforcement' these days wants it all like a computer game. That is, GPS gadgets in the truck or bus, "calling home" with instant replays of what the driver did. That works with a GREYHOUND, J. B. HUNT, et. al. So many recollections. Like that time I went to Frederick, MD for a Court Trial on one of my men. I was on the record as an expert witness, and a character reference. I explained to His Honorable Judge that: The 'Log' rules full of ambiguities. I could provide ten different men, all with differing ideas on how to log a particular set of circumstances. We could probably write a book on "Log Book Games". 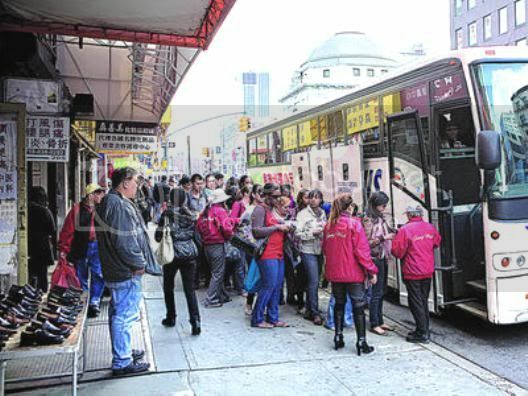 Huge buses have begun to compete with smaller ones to ferry passengers between Chinatown in Manhattan and Chinatown in Flushing Queens. By JEFFREY E. SINGER and COREY KILGANNON New York Times June 29th. 2012. Six large, white tour buses rolled up last Sunday morning looking as if they were bound for a casino, and, in fact, some of them bore the faded logos of Atlantic City casinos. But the buses that appeared on this particular block in Queens for the first time were not picking up gamblers - they were loading passengers in Chinatown in Flushing who were traveling to Chinatown in Manhattan (the large buses charge $1 for a one-way ride; the smaller buses have traditionally charged $2.75). The sudden arrival of the coaches has set off an upheaval in a popular transportation network stitching together some of New York?s largest Chinese neighborhoods that, after the public system, may be the second-busiest in the city but remains largely unknown. There have been heated arguments between rival operators and a price war as the buses try to steal customers from the smaller buses, or large vans, that have been plying the routes for years. Some of those working for the larger buses trying to elbow their way in are refugees from another shadowy transportation system ? the fleets of inexpensive buses that pick up passengers in Manhattan?s Chinatown and ferry them up and down the East Coast. In May, federal officials shut down 26 such bus companies, citing serious safety concerns. Now, it seems, some of those operators are looking for new business. 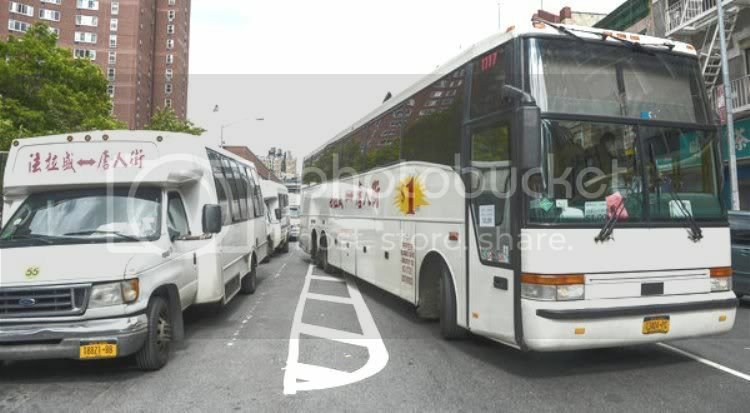 On Sunday in Flushing, the more veteran operators reacted with alarm to the large buses. ?The big bus is here, the big bus is here? were the words transmitted in Mandarin over the networked phones that the driver-owners keep on their dashboards. ?I absolutely couldn?t believe it; how could that be possible?? one driver, Zhang Peng, said. ?It was completely illegal.? The smaller vehicles that travel between Chinese communities in the city are typically owned individually by their drivers who collect the fares for themselves but often pay fleet owners to deal with city agencies and to handle licensing and other bureaucratic matters. Competition has been cutthroat for years, characterized by fistfights, screaming matches in traffic jams and underhanded tactics between fleet owners to gain an edge. But now it has been ratcheted up higher than ever by the large buses, with their 57-passenger capacity and rock-bottom prices ? they were charging $1 for a one-way ride between the Chinatowns in Queens and Manhattan, compared with $2.75 to ride the smaller vehicles. Some of the new workers, including Chen Yuying, 40, said they had recently been laid off from the interstate lines as a result of the federal crackdown. She and other hawkers who arrived with the big buses were promoting the new low fare near Confucius Plaza in Manhattan?s Chinatown this week, pulling in passengers happy to pay it. Feeling muscled out, the other drivers tried desperately to lure passengers, even resorting to jumping out of their smaller buses and doing their own barking at customers that they too would offer the dollar fare. One driver, Yu Nianxi, 59, made the offer grudgingly because it would cause him to ?lose money with every trip.? ?Government closed the big buses because they were not safe,? he said. ?Now they?re here? What kind of safety is this?? Van drivers said that despite the intense competitive climate, they had usually managed to maintain a working relationship, and some sort of order, by agreeing to take turns and following a numbering system to share passengers. The big buses? arrival has upended that gentlemen?s agreement, they said. The ownership of the big buses was hard to determine ? their drivers refused to answer questions. Many van drivers said the big buses were brought in by Tony Luo, the longtime king of the commuter van industry. Mr. Luo, who runs his business out of an office opposite from a van stop on 41st Avenue, just off Main Street in Flushing, did not respond to messages. The large buses had no visible city licensing stickers of the sort displayed by the vans. Rather, they displayed federal licensing numbers, typically used by interstate buses, and the name New Oriental Tour. According to New York State records, New Oriental Tour is based at the same address on 41st Avenue that Mr. Luo uses for his livery car service, Yes Car Service. Under New York City law, commuter van services are permitted only to operate vehicles of up to 19 passengers, a spokesman for the New York City Transportation Department said, adding that the agency would investigate the situation involving the buses. Councilman Peter Koo, who represents Flushing, said the size of the buses and the length of time it took to fill them could aggravate local traffic. ?Big buses are for interstate travel,? he said. ?They?re not good for traffic, especially in Flushing.? One driver, Zhang Wenjun, 42, who began driving the smaller buses a year ago, said that he paid $50,000 for his van and that even before the big buses arrived, he was lucky to clear $100 a day after expenses. Now his ridership had largely been siphoned off by the large buses, he said. Some longtime passengers offered to pay him $2 a ride, as a show of loyalty, he said. ?I have to pay for maintenance, insurance, pay rent ? still owe $30,000 for the minibus,? he said. ?Now the big buses are here, and there?s nothing I can do about it.? Sounds like the only way to stop this bunch would be to impound the buses.